Summary: Jennie is in the fifth grade. She hangs around with her two best friends, Diane and Sharon. Their teacher, Mrs. Hanson, asks Jennie to show Elsie, the new girl, around the school. Jenny wishes she hasn’t been asked. . . Elsie is the fattest girl she has ever seen, and doesn’t want associated with her. 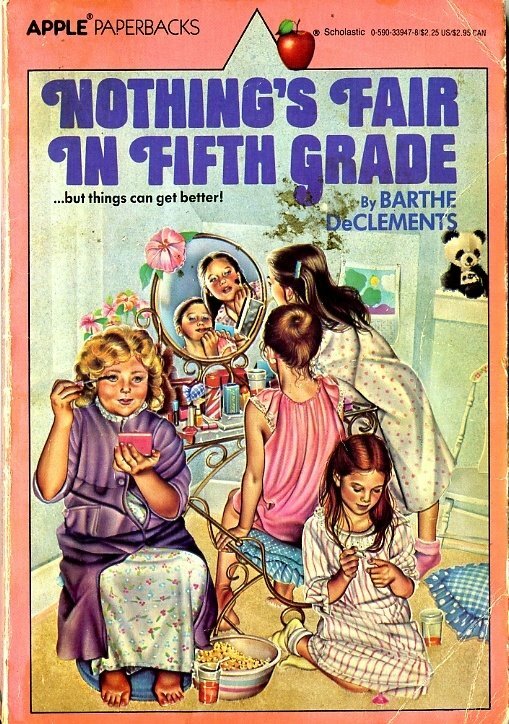 Through a series of events throughout the book, Jenny learns about Elsie’s life (and Elsie is great in math, and tutors Jenny), and becomes more compassionate. Eventually Jenny and Elsie really become friends. Doctors making house calls (page 40 – “I’d drink it and throw up. The doctor came. He told mother I was dehydrated”) : I thought it was funny back when I first read this, too. I was aware that doctors used to make house calls back in “the olden days”, but I was around in 1981 when this was published. My doctor didn’t make house calls back then. No, we had to go wait in the waiting room for three hours to be seen finally, because they were always so behind with their appointments. When would the doctor have had time to get in a car and drive to our house? This is something that today’s kids really wouldn’t get at all, either. They liked to watch “Mork and Mindy”. Even by the mid-80s when I read this book, I really was not familiar with that show. This was first time we had cable tv in our house, and we enjoyed whatever was being shown on Nickelodeon – mostly shows such as The Monkees, as well as programming like You Can’t Do that On Television, Double Dare, etc. Anyway, part of my point is that this could be relevant today, to today’s 10 year olds, but because of the references to shows that were on 30 years ago now, this almost seems like historical fiction at times to someone reading it today. I just looked up Mork & Mindy on IMDB – It was on the air from 1978 to 1982. It seems that the DVDs have been released. Then there is the music. I love record players and old records. However, it’s funny when they listen to the Bee Gees, and they are changing records. At the time I didn’t blink an eye when Elton JJohn was mentioned, because he was still popular and records were still around though on their way out. Jenny’s mom buys a Burl Ives record for Jenny’s little brother Kenny. Burl Ives? Even as a kid at the time, I had no idea who Burl Ives was. Jenny’s Dad: He’s very opposed to Jenny’s mom getting a job, even though her job will help pay for a new car, which they need. He wants her there at home when he wants to eat. Also, he wanted her there to be with the kids, because he goes bowling. He’s a very one-dimensional character who is very ’50s TV father-like (like the one brought to life in the movie Pleasantville). As a kid, I thought this was just odd, because of course women could work, and in my experience up until the time I first read this book, my dad never went bowling. I thought that was silly. Dads performed weddings and took moms to wedding receptions. Jenny’s dad didn’t cook. Mine did on occaison, and would make stuff my mom never would – like rhubarb pie. Elsie loses weight, eventually, as the book goes on. The teacher at school has to help “police” Elsie’s diet, because Elsie would beg for food from her classmates. I am sure this was easier, because the students ate their lunches in the class room. I keep pointing out the weird stuff, but I always thought that would be fun, to eat in the classroom. In none of my schools did we ever have to eat in the classroom. We had lunch room space elsewhere in the school. I always wondered in what school DID kids get to eat in their rooms. I always thought that would have been easier, because then you already have your assigned seating, and you wouldn’t have to worry about who to sit with, and all of the other anxiety-producing issues that come with the lunch room. There is perhaps more to say about this book, and I will work on it if time allows. The cover above is my own original copy from back then. I wrote my name on the cover page five times with a variety of writing utensils (a multi-colored pencil, blue ballpoint pen, and two Magic Markers – blue and brown). My mother was tutoring a girl one summer, and used this book. I wanted to make sure I got my book back! I was not trusting it with anyone else.